"One of my favorite side dishes, as it's very easy to make! I personally love garlic so I go crazy with it, but put as much as is good for you. This is a very simple recipe and you can put as much or as little of the seasonings you want." Cut the bottom off of the cabbage and set it so that the flat end is on the cutting board; cut into 1-inch thick slices. Arrange slices in a single layer in a large casserole dish. 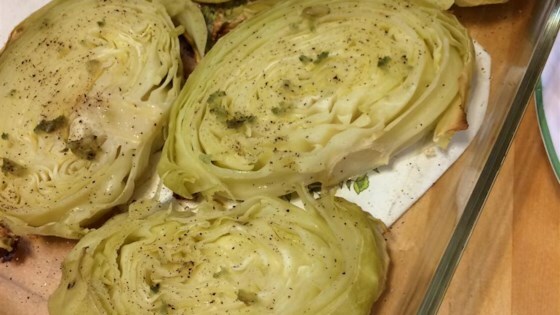 Drizzle olive oil over the cabbage slices and top with garlic. Season cabbage with salt and pepper. Cover the dish with aluminum foil. Bake in preheated oven until the cabbage core is easily pierced with a fork, about 45 minutes. I loved it! I used a little butter too and put the oven to 375 for 45 minutes. It was perfect! I did make sure to cut the steaks at 1 inch so they would cook quicker. Definitely a do over! It tookrme 3 hours lin the oven, set at 350 to get rid of the crunch. Used a lot of minced garlic, soy sauce and it was good. I will stick to frying mine in the cast iron skillet, though. This was a delicious surprise! I cut them a little thinner than an inch and cooked at 375 degrees for 40-45 minutes. A definite repeat in my house! I loved this! I added garlic tomato basil seasoning and bacon bits to it prior to cooking and it turned out delicious! I've made this recipe and it's really good. I think the only addition I had was to grate some Parmesan cheese over it at the end. Really tasty and a nice side dish to just about anything!